New York : Dell Yearling, 1993. A phone call at two o&apos;clock in the morning alerts sleepy sleuth Nate the Great that Rosamund&apos;s pillowcase is missing and Big Hex the cat needs it to be able to sleep. Nate the Great and the Pillowcase. 100 Personl Name ME 1b $a Personal name Sharmat, Marjorie Weinman. 245 Title 00 $a Title Nate the Great and the Pillowcase. 300 Physical Desc $a Extent various. 520 Summary Etc. $a Summary, etc. 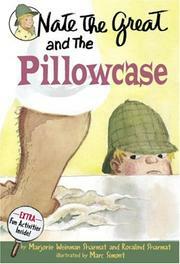 note A phone call at two o&apos;clock in the morning alerts sleepy sleuth Nate the Great that Rosamund&apos;s pillowcase is missing and Big Hex the cat needs it to be able to sleep. 650 Subj:Topic 4 $a Source other than LC READING LEVEL 2.2.